Graham cracker treats are a simple little goodie from my childhood. I can picture my mom sitting down at the table with a box of graham crackers and a can of frosting, methodically churning out these little sandwiches. I don’t have them as much now that I’m an adult but when I had some leftover frosting from the birthday cupcakes I made I knew exactly what to do with it. Serves as many as you want! Take a graham cracker and break it in half. Slather as much frosting as you want on one side and top with the other side to make a sandwich. Place in container. Repeat until grahams and frosting are gone or until you have as many sandwiches as desired. 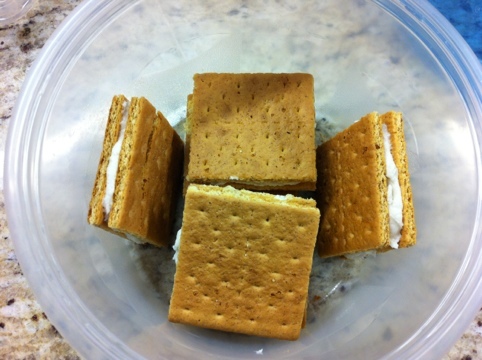 Place the lid on the container with the graham cracker treats inside. Leave on the counter out of reach of hungry little hands for several hours or overnight. The Tupperware magically softens the graham crackers leaving you with a tasty treat. Mom used to make these with chocolate and vanilla frosting. Though I got to thinking this week that it would be fun to try these with strawberry or maple frosting. And if chocolate graham crackers exist I think they would be delicious with mint frosting or the peanut butter frosting I used to top some brownie bites awhile back. I wonder if it would work with nutella? I’ve often wondered if it would work with peanut butter. If you try it let me know.